Imagine a town of a million or so inhabitants at the edge of the Sahara desert. It lies directly on the Atlantic coast, but wait, its fringes are some 200m away from the dunes stretching along. These dunes are around 20m high and 30m wide. Behind the dunes lies a depression, a lagoon dried up long time ago. It stretches inward for a mile or so until the endless suite of dunes of the real Sahara start rolling. More than half of the town has been built, unfettered by any rational planning, in the depression. The town has grown rapidly due to immigration from the oases and Sahel fringes where life is becoming harder and harder due to climate change and economic decline. From the northeast the winds are carrying sand from the dunes and deposit it softly but steadily on the houses, roads and people of the city. Along the coast the oceanic currents – still rich in fish – nibble at the sandy ground, constantly taking away loads of sands down south. The fishing and industrial harbors have to be protected against this erosive force. Merry lads used to moto-cross on the dunes until that practice finally got banned by the authorities because of its destructive effects on the plant cover stabilising the dunes. 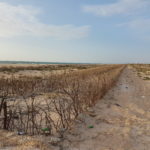 Along the 50km of dunes which dam the seawater a total of 18 breaches have been identified in a scientific study, but only 3 have been fixed so far by means of filling, compression and replanting. At any stormy day, when things go wrong, the sea water may intrude and inundate more than half of the city. But that’s not all. 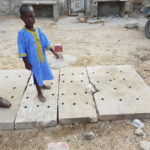 Leaks in the water pipeline which pumps water from the Senegal river (lying 70km down south) into the city have soaked the underground like a sponge so that even 10mm of precipitation already cause widespread flooding in the lower parts of the city – and these make up most of the city. As rainfalls have soared due to climate change in recent years during the rainy season (which corresponds to European summer), the city is facing more than 100mm of annual rainfall. Yes, we are in Nouakchott, the capital of Mauritania (3,6 Mio. inhabitants) in the age of climate change. The situation is risky beyond belief, but still life is going on calmly in this sunny far-away place. Yet, the President and his government have become aware of the danger…not least because of attending and contributing to international conferences on climate change. They commit to design programmes and to engage donors for climate change adaptation. One of these endeavors has been the German-funded programme “Support to climate change adaptation of coastal towns in Mauritania” (ACCVC, 2012-2017). Intervention area 1: „Mainstreaming of climate change adaptation / Climate Proofing“: This area was about developing methods and instruments to integrate climate change adaptation into planning processes for managing coastal towns. Intervention area 2: „Exchange and management of information“: This area was about improving the knowledge base for climate-resilient costal management and urban planning. Intervention area 3: „Development and implementation of pilot projects with concomitant enhancement of management skills“: The model-like, labor-intensive and fairly replicable implementation of climate change adaptation measures (two water collection systems relieving more than 200 households) focused on those neighborhoods of Nouakchott which are particularly exposed to flooding. In the coastal zones the above mentioned three breaches in the dune belt have been closed, and the dunes were replanted to stabilize them. All these measures strengthened the planning and implementing capacities of national and municipal stakeholders responsible for the climate-sensitive management of coastal towns. It has to be underlined that the approach chosen was people-centered and gender-sensitive. It was the people themselves who carried out the risk diagnosis, who decided on the short-term measures to be taken and who provided a good part of the labor force. All the measures were planned and engineered by local entrepreneurs. The end-of-term evaluation by the end of 2016 has resulted in the recognition that the project has created technically proven and replicable solutions for rehabilitating and stabilizing the dunes as well as for rain water evacuation systems with the participation of the local population. The living conditions of particularly vulnerable population groups in the city neighborhoods especially exposed to flooding have been improved. Still during the lifetime of the project, partners have replicated pilot measures. However there is still the need of doing a lot more in that direction. Each and every dune breach – still 15 in number – poses the risk of a general flooding catastrophe. Virtually every rainfall event leaves large ponds of foul water putting the health of people in danger and making houses inhabitable and roads impassable. For consolidating the enhanced capacities more projects will have to follow….the negotiations are under way. 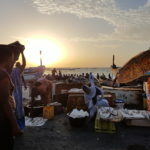 The right picture is the fishing harbour of Nouakchott. It is endangered by coastal erosion and shall be rehabilitated and protected with the help of a World Bank Project. The middle picture is a stabilized and replanted dune. Tamarisk and two other species are used to fix the soil. The wood sticks are there to protect the seedlings from wind erosion. The left picture shows one of the gullies of a local drainage system which protects some 100 households in a neighborhood from flooding after rainfall. It is situated below sea level. The collector drains lead to a subterranean basin which has to be evacuated by a public tank car service.